A double-drive wheel is free-treadling because there's no friction from a brake band. 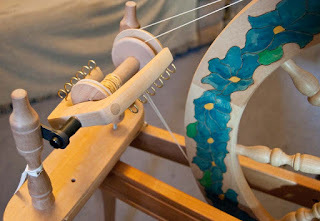 If I take my foot off the treadle now, it will run for many revolutions before it decides to slow down and stop. As with all Ashford double-drive wheels this one can now be easily switched between double and single-drive modes. I converted mine in a lunch-break using only a double-drive flyer and whorl (and bobbins of course). There is a little bit of drilling and hammering involved. If you're interested, I'll be putting together a kit including instructions. 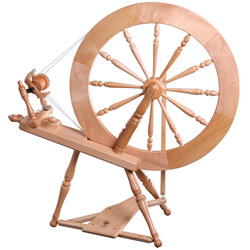 In the mean time, it's pretty easy to figure out how to do it and I do stock the double-drive flyer and the bobbins. I've used a standard flyer here, but you could just as easily use a sliding-hook flyer kit and benefit from the 30% larger bobbins. Note that if you're buying a new wheel, the double-drive version is only a few pounds more than the single-drive - cheaper than converting it later. But all the extra bits will add complication for a new spinner. If you're buying a secondhand Trad, the chances are it'll be single-drive because there are so many more of them around. I just purchased a used single-drive Traddy and would like to upgrade to a double-drive (high speed). As far as I can tell, I will need to reposition the M-O-A (and reposition the belt tensioning device), which will involve some drilling etc. So can I get by with just purchasing a "high speed double drive adaptor kit" (new flyer, DD whorl, and 3 DD bobbins)? I don't need to get a whole new MOA assembly, do I?